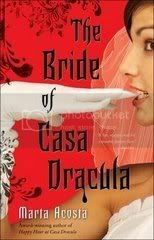 I just finished The Bride of Casa Dracula by Marta Acosta, our friend at Vampire Wire. If you are not familiar with the Casa Dracula series, I would highly recommend reading the first book - Happy Hour at Casa Dracula, and the second book - Midnight Brunch. I have reviewed them here and here. If you haven't read these books, this review might also spoil some things for you. Milagro De Los Santos is having problems planning her wedding to the fabulous Oswald Grand, M.D. Not only do her future in-laws loathe her, but they have a genetic anomaly that makes them crave blood. Milagro's extravagant best friends hijacks the role of wedding coordinator, but then the secretive Vampire Council assigns conniving Cornelia Ducharme to guide the couple through the ancient vampire marriage rituals. And why is Cornelia's decadent, way too attractive brother, Ian, continuously showing up whenever Milagro is away from Oswald? When a series of accidents interferes with wedding plans, Oswald worries that Milagro is cracking under the pressure. Is she just paranoid, or is a hidden enemy trying to make sure Milagro doesn't wed the undead? I started this book late last night and grudgingly put it away so I could get some sleep. I even woke up early and finished the book, which says a lot because it's a Saturday morning and I love the chance to sleep in. Milagro is still smart, stubborn, funny and sarcastic, but now she seems more comfortable in her own skin. We see her more confident and we get a better sense of who Mil is. I thought Milagro was great; she isn't your classic female character. Mil knows she wants to write, knows what she likes to write, loves to garden and get in the dirt, enjoys cooking, and doesn't let anyone make her feel bad about what she loves to do. She's not dependent on a man to make her happy either. When she is away from Oswald, she may miss him, but she has fun with friends and by herself. The character so The Bride of Casa Dracula were strong and interesting. We get to better know some of the characters we've already met and some of them are bound to surprise us. Nancy, Mil's best friend, was great, Edna was entertaining, and Ian was as charming as ever. Acosta did a wonderful job creating dialogue, emotions, and relationships between Mil and the other characters. TBCD was funny too. I laughed out loud several times. The book was entertaining and it kept me interested. It was also well-written and was probably one of the best books I have read in a while. It is unique, funny, heart-warming, and it kept me guessing. Vampire lovers will enjoy this book, but so will those who don't normally read paranormal fiction. I genuinely enjoyed this book and would definitely recommend it to anyone. It's not just a paranormal romance, it's much more than that. Milagro is a unique character and the book isn't cut from a cookie cutter. The characters are real and their joys, struggles, successes and stresses are realistic and tangible. People of different ages and backgrounds can enjoy this book. I think TBCD is the best one so far in the series. If Acosta wrote a number 4, I would definitely read it. The Bride of Casa Dracula comes out September 16th, make sure to get your copy!